The essay starts mentioning Giorgio La Pira, member of the Italian Constituent Assembly, who recommended inter-religious dialogue as a way towards the World’s pacification. Then it deals with the evolution of post-Counciliar Catholic Church and its struggle in favor of religious freedom, both individual and institutional, as a fundamental right of the human being. Comparing religious freedom as guaranteed in the documents of the International community and the protection accorded by Islamic declarations, the Author points out the difficulties of a dialogue between Christians and Muslims. The political community should create the conditions in order to develop such dialogue without controversies and should verify that in every society reciprocity is granted. The article concludes with the Pope Benedict’s invitation to Abrahamic religions to enhance the dialogue of everyday life and of intellectuals. KEY WORDS: religious freedom, inter-religious dialogue, reciprocity. 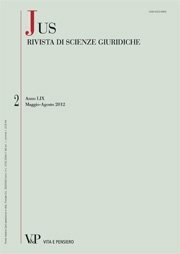 In this essay, the Author tries to analyze, according to a taxonomic order, the fundamental features and the systematic evolution of the constitutional guarantees concerning civil and criminal justice, in the italian (and international) frame of the “fair” (“due” or “just”) trials and proceedings. The analysis’ results lead to outline some remarkable (but not always satisfactory) prospects for the future. KEY WORDS: fair trial, fair process, due process of law; strict procedure rules in the adversary systems of civil (and criminal) justice; procedural and ethical fairness; parties’ legal duties and deontological behaviour before the judge; lawyers’ professional ethics ; duty and candor in the proceedings. A framework of substantive law is drawn and the enforcement of individual entitlements (rights etc.) and public powers emerges as the sole excluded matter. So procedural law has to coincide with the regulation of proceedings aimed at said enforcement subject to, or under reserve of, an impartial checking of the contended rights and powers. Since it is forbidden to modify everybody’s state of affairs without a due process of law, everybody has a (substantive) right thereupon, mutually exclusive with the opposite contended right and both rights are part of the subject matter of every enforcement proceedings. All the rules governing the assessment of an enforcement proceeding’s substantive lawfulness are part of substantive (not procedural) law. KEY WORDS: rules, provisions, seminal and derivative rules, duties and entitlements, rights and powers, substantive law, procedural law, enforcement proceedings. The legal issues related to computer equipment often concern the development of the subjects for which they are intended. For the lawyer a comparison is required not only with computer science but also with other disciplines relevant to solving a real judiciary problem. In any case, the rules pertaining to the use of computer technology must ensure at the same time the right to privacy in the collection and management of information and the security of data and systems, protecting them from unauthorized access. With specifi c regard to digital evidence is not suffi cient then to comply with the requirements of due process, but it is necessary that technical rules are observed to achieve reliable fact finding: once again, requiring an interdisciplinary approach. KEY WORDS: computer science, digital evidence, fair trial, human rights. The last, posthumous book by Giorgio Berti, published in 2008, comprises both new pages (sometimes autobiographical) and pages (sometimes revised) appeared over twenty-five years. It is therefore a book that offers a quite precise idea of Berti’s thought with regard to a considerable part of his main research topics: constitutional interpretation, public responsibility, relations between public and private law, administrative justice, science of administration. Starting from this book, the paper aims to offer some considerations about Berti’s views. It is mainly focused, on the one hand, on some methodological aspects and, on the other hand, on the reversal of the relation between legislation and administration. By that the author means that the fundamental source of legitimation of the administrative action is not political, but social. It follows, among other things, an idea of legitimacy as the fulfilment of social needs, rather than the mere respect of forms, and the belief that a never-ending dialogue between society and administration is needed. But, to be authentic, this dialogue requires the mutual recognition of the interlocutors. KEY WORDS: social needs, social legitimation, dialogue, mutual recognition, reversal. Epistemology matters rarely have been deeply analysed within legal studies. The aim of this paper is to investigate, through a historic approach, the existing differences and similarities between methods used by Italian scholars belonging to different Schools of legal thought. The paper, after the analysis of some crucial issues pertaining to the origins of the public legal science in Italy in the second half of the nineteenth century , explores the evolution of the Italian public law, from the points of view of the applied methods. Relevant similarities are indentified in the tackling of epistemological problems concerning the relationships between legal order and socio- political order. Moreover, some meaningful connections between social sciences, emerging in the writings of remarkable Italian scholars, are highlighted through an epistemological lens. KEY WORDS: Italian public law, methods, legal order, relationships between social sciences.